Rather than holding up cobwebs behind a garage or taking up space in the shed, bicycles that are no longer being used here have proved to be an invaluable resource that has changed the lives of many Africans. Australian Michael Linke first got the idea of gathering unused bikes to give to the people of Namibia while backpacking, when he saw scores of unused and abandoned bikes in Western countries that he realised could be used for the greater good if they could be given to people who really needed them. The result is the Bike Empowerment Network (BEN Namibia), which Michael kick-started with help from the global organisation Bicycles for Humanity. The project now has 25 “shops” across the country, many of them simply the converted shipping container that these bikes were transported in – which Michael may have last seen sitting on a dock in Melbourne. In his first month in the south-west African nation, Michael trained one part-time bike mechanic and distributed three bicycles. 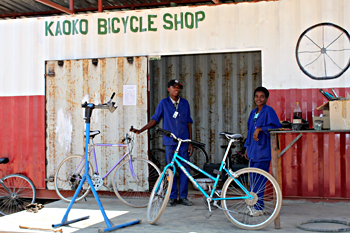 Five years later, and 12,000 bikes have been imported by Michael and his wife Clarice, and more than 500 people have been trained in bike repair. The difference such simple two-wheeled transport can make to a poor villager is extraordinary. Most people in this country get around by foot, as very few can afford a car. Health workers, for example, who may have had to walk long distances, sometimes up to 30 kilometres to visit a patient, can now access remote communities more frequently. Find out more at benbikes.org.za/namibia, and you can read Michael’s blog at bicyclesafrica.wordpress.com.